Lutherans and Mennonites can trace some of our main differences to the conversion stories of our founders, Martin Luther and Menno Simons. October 31, 1517, was Reformation Day, an event that produced the second great division in the one, holy, catholic, and apostolic church of the West. By some counts, the Protestant movement has since produced 45,000 more divisions we call denominations. Centuries earlier, the apostle Paul urged the early Christians in Ephesus to “make every effort to keep the unity of the Spirit through the bond of peace. There is one body and one Spirit, just as you were called to one hope when you were called; one Lord, one faith, one baptism; one God and Father of all, who is over all and through all and in all” (Eph. 4:3-6). We might conclude from Paul’s statement that divisions should cease, denominations should dissolve, and the Christian Church should reunite as one big family. Notice, the word happy was omitted intentionally. For example, Lutherans and Mennonites have dialogued since 2002 about our differences and have expressed forgiveness and pledged cooperation with one another. Each admit that the other belongs to the extended Christian family even if we do not attend all the same family gatherings. The differences have to do with beliefs, practices, ethics, organization, and traditions now 500 years in the making. Differences between even two Christian groups are complex. Now let’s simplify the issues. Lutherans and Mennonites can trace some of our main differences to the conversion stories of our founders, Martin Luther and Menno Simons. Like the influence of parents on their children, the experiences of Luther and Menno have imprinted their descendants for generations. The Reformers wrote of their conversions years after the fact. Luther described his conversion in 1545, recounting his experience of God’s grace in July 1519. Menno in 1554 wrote an account of experienced of God’s conviction and his conversion in 1536. The conversion stories of Luther and Menno reveal the distinctives between the two Reformers as well as the two traditions that developed over the past 500 years. Consider the features of their stories of coming to faith in Christ. While there are similarities, the differences are also striking. I will highlight some of the more important distinctions. What can we learn from the two conversion stories? Let’s reflect on the stories of transformation, before, during and after conversion. Again we discover as many differences as similarities. Perhaps we should not be so surprised at their differences considering the conversion stories we hear in church every year at baptism. Before their conversions, Luther and Menno came from very different places, backgrounds, and mindsets. Luther was a university lecturer who encountered a biblical, theological, and philosophical problem that tormented his spiritual life as well. It seems that for Luther, the biggest problem was with a God of wrath and not so much with Luther the sinner. Menno was a parish priest serving without ever having read the Scriptures. Menno started reading the Scriptures, but admitted that he wasted this knowledge through youthful lusts, sensual living, and looking for the favour of people. Luther started out to please a wrathful God while Menno started out to please worldly people. At their conversions, Luther and Menno experienced a deep crisis of faith. Luther admitted he was a sinner, but was angry at a God who was not satisfied with his attempts at repentance. Luther was converted by an insight from studying the Bible that God justifies the sinner by the gift of faith. Luther had a theological conversion and repented in his beliefs about God. Menno grew in awareness that his preaching of Scripture clashed with his sinful lifestyle. Menno was converted by the conviction that God would judge him for misleading his parishioners through hypocrisy. Menno had a moral conversion or a repentance of heart toward God and people. After their conversions, Luther and Menno followed experienced different emotions and callings. Luther felt “altogether born again and had entered paradise itself through open gates.” He returned to his study and was comforted to discover that his mentor Augustine had written similar ideas about justification by faith years earlier. Nine months after Menno’s conversion, he felt God’s Fatherly Spirit empower him to renounce his worldly reputation. Menno yielded to “the heavy cross of Christ” and accepted the call to lead a small group of the Anabaptist faithful. The two conversion stories are quite different. Luther’s conversion transformed his life from tormented anguish of soul in anger towards God to a place of love for God and the proclamation of God’s grace. Menno’s conversion transformed his life from sensuality, ease, and popularity with people to a place fearing for his life and the proclamation of obedience to God. 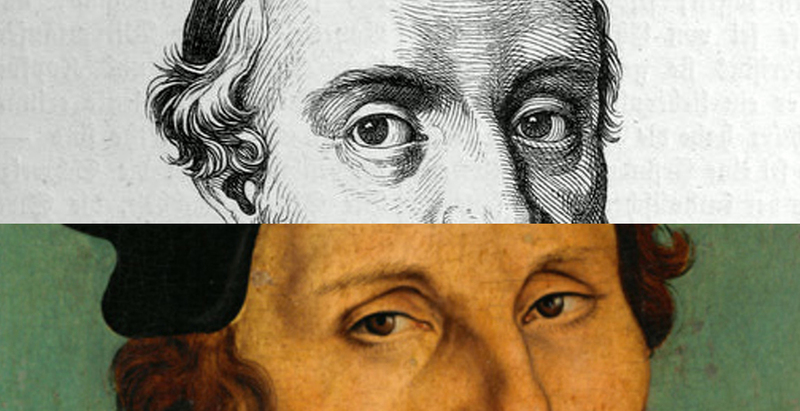 Both Luther and Menno in their conversion stories indicate that they were ministers of God before their conversion. Luther posted his 95 Theses two years before his conversion. Menno served as parish priest 12 years before his conversion. Both confessed troubled souls. Both identified a moment of enlightenment when a new understanding of God’s Word transformed their minds. Both yielded themselves to the grace of God after their conversions. Both continued to serve God resulting in a renewal of worship, beliefs, and morals for generations of followers. While I hear many Christians lament the disunity in the Church today, the Reformation has become more of a blessing even considering the great difficulties experienced in the early years after 1517. Why? Because the message of unity is not the only word in the Scriptures. Paul continued his appeal to the early churches by celebrating the importance of diversity in the body of Christ as well. One legacy of the Reformation is found in the conversion stories of the Reformers and their followers. Like faith stories today, no two Reformers were identical. The conversion stories of Luther and Menno are quite different. The Reformation advantage is that over 75 million Christians identify more fully with the body of Christ because Luther and Menno taught us to see God’s grace in different ways. Still, 500 years later we are Christian first, and only then Lutherans or Mennonites, because there is one Lord Jesus Christ, one faith, one baptism, one God and Father of all. In the case of Luther and Menno, how about three out of four? Dr. Terry Hiebert serves at Steinbach Bible College as Academic Dean and enjoys when students get excited about theology. He is married to Luann, a college English instructor. They have three adult children and four energetic grandchildren. Terry and Luann enjoy their dog, a tiny house project, and long distance travel. They attend Gospel Fellowship Church (EMMC) in Steinbach, Man.